We could write a book about the history of extruded coconut charcoal as it relates to ceramic cookers, but we'll try to keep it to a few short paragraphs. High quality extruded coconut charcoal is a wonderful thing, burning with high heat, low ash and a sweet smell. It also burns with a constant even heat, much like briquettes, which endears it to the cook who is doing long overnight low and slow cooks. And for a few short years back around 2002-2004, it was possible to obtain quality extruded coconut charcoal. However, once that supply was gone, no more was to be had. One word about the comparisons we'll be making between this charcoal and others. We now have reviewed nine different extruded coconut charcoals and have enough data points, if you will, to draw comparisons among the different types. So the star ratings you see at the top of the review reflect how this charcoal performs against other coconut charcoals. However note that if you view our comparison page of all brands and types of charcoal, the star ratings there will reflect a comparison with all the charcoals in the table. Our box of charcoal was sent via UPS, whereas normally if you were ordering this charcoal, you would probably be ordering a large quantity via truck in order to reduce the shipping cost per box. As you can see in the photos below, our box arrived in good shape. The charcoal is contained in a plastic bag, and when you open the bag you find a sheet of paper towel on top of the charcoal. The idea behind the towel is to absorb any moisture that might be driven off the charcoal if a box is exposed to high heat during shipping. Then instead of condensing on the plastic and dripping onto the top layer of charcoal, possibly allowing mold to form, the moisture will be dissipated when it evaporates from the towel. Once you remove the towel, you then find the charcoal beneath. Now let's look at the individual pieces. They are approximately 9 inches long and 1-7/8 inches across. The hole down the center is 3/8 inches in diameter. The pieces average about 15.5 ounces each, or 439 grams. One comment regarding the size of the pieces, they are 9 inches long in order to reduce handling during it's production. We would prefer pieces that were cut to 1-1/2 or 2 inches in length. As we would use this charcoal, there would be far more times when we wanted smaller pieces than 9-inch pieces. When you want smaller pieces, it is easy enough hold two pieces and strike one against the other. You can break logs into 3 fairly even pieces this way. For testing we needed the smaller 1 to 1� inch pieces and cut them with a brick chisel and hammer, but it is a bit of a hassle to do that when you want these much smaller pieces. Burn time was high compared to the other coconut charcoals we have tested. Truth be told, most coconut charcoal doesn't burn terribly long when you compare it to lump charcoal, but as far as coconut charcoals go, this one does a commendable job. Probably one of the more disturbing aspects of the truly inferior coconut charcoals sold is the monumental amounts of ash they produce, in some cases, even more ash than briquettes. So, one sign of quality coconut charcoal is low ash. This charcoal contained 3.2% ash, comparable to the Philippine charcoal we reviewed in 2003. The volume of ash produced when we burned a standard amount of the charcoal was very low, again comparable to the best coconut charcoals we have reviewed. We don't normally measure moisture content of charcoals we review, but in order to measure the ash content, we have to measure moisture first. The moisture content we measured was 8.3%, not a bad figure. About the only guage we have for judging if this is too high or not is by noting if there is any moisture generated on the lid of our cooker after we run our maximum temperature test. There was none. The lighting test is always a little tricky from the standpoint that the ease of lighting depends among other things upon the size of the pieces of charcoal you use in the chimney. To get a fair comparison, you need to try to keep the sizes of the pieces between brands comparable. In order to do this we cut the pieces of charcoal into 1 to 1½ inche pieces, comparable to the size of the Philippine charcoal. The pieces were comparably sized and the results were comparable as it took 6 sheets of newspaper to light this charcoal, as did the Philippine charcoal. In our opinion, the best way to light this charcoal regardless of how you intend to use it is to put smaller pieces into a chimney, start them, and then use them to start the rest of your fire. The maximum temperature we were able to obtain with this charcoal was 978°F which is very high even for lump charcoals. This charcoal will definitely get hot enough to do anything you could want to do in a ceramic charcoal cooker. Also, after we let the charcoal burn for about half an hour, we then snuff the fire and wait for it to cool down. At that point, we give the charcoal a gentle stir to see if the remaining charcoal will hold together or turn to powder. Some of the inferior brands would indeed crumble to useless powder. This charcoal remained fairly intact and reusable. Bad coconut charcoal smells like a bad cigar. Good coconut charcoal has a mild and slightly sweet smoke. The smoke that comes off this charcoal is indeed the the slightly sweet and pleasant smell of quality coconut charcoal. We grilled some turkey wings over this charcoal and it imparts a light and pleasant flavor to the food. We cooked some turkey wings on the Smokey Joe to taste the flavor food takes on from this charcoal, and we had to remove about half of the pieces of charcoal from that single layer we had used to measure the grill temperature in order to get the cooker temperature down to a more reasonable 400°. So if you do use this charcoal for grilling, just be aware how hot it burns and adjust accordingly. Purchasing this charcoal requires some effort on your part. You can email Komodo Kamado and place an order easily enough, but the shipping is expensive unless you are willing to go in for a large amount. There are shipping breaks for larger orders and if you are interested, you may wish to enter into a group purchase and split the order up. The Komodo Kamado forum has a section devoted to getting people together on these group orders. However, Komodo Kamado has worked hard to obtain rock bottom shipping rates for their charcoal, so getting in on a group order is worth looking into. You can also reduce the cost of shipping if you agree to pick it up yourself at a business or shipping terminal. The boxes obviously stack well, and you can put quite a large amount of charcoal into a pickup or SUV. And finally, if you purchase a grill and order charcoal at the same time, the shipping is even lower. It is definitely worth the effort to contact Komodo Kamado and see what would work best for you. It appears that it is now possible to find a steady reliable source of quality extruded coconut charcoal. 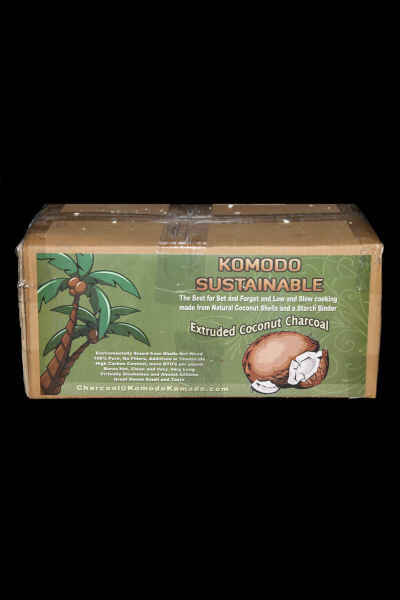 Komodo Kamado's Sustainable extruded coconut charcoal performs very well in all categories when you compare it to all the other coconut charcoals that we have tested. We are pleased to give our Highly Recommended rating.